Finding a cost-effective way to pay your employees while remaining complaint with all the current payroll laws can sometimes be a daunting task. 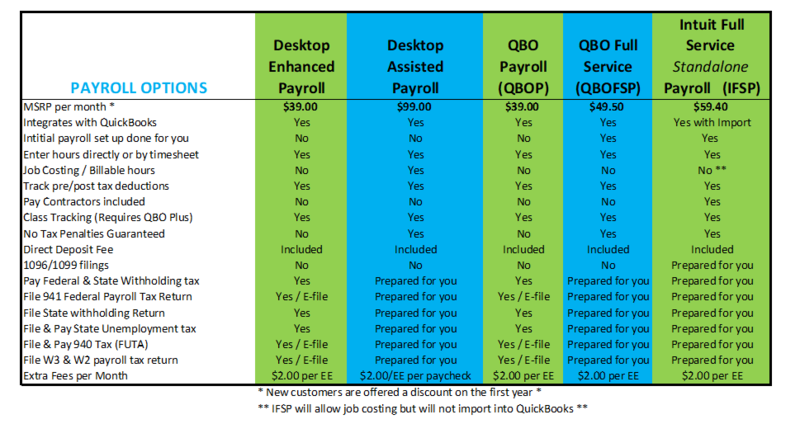 Intuit offers several different payroll options both inside of QuickBooks or using a product that imports into QuickBooks. All of the payroll options Intuit currently supports allow for you to process your own payroll, print checks inhouse or utilize our free direct deposit option. QuickBooks Desktop (QBDT) and QuickBooks Online (QBO) both offer options that allow you to prepare and file your tax returns/payments or have Intuit handle these services for you. Within the financial products you can keep payroll confidential by selecting the proper login user permissions. Keep in mind there is a third option that is not integrated as it is a stand alone payroll solution but you have the option to import the data into all QuickBooks financial products, including QuickBooks Pro for MAC. In these two integrated options you run the payroll checks. It integrates directly into your desktop QuickBooks allowing you to allocate your hours in service to job costing, multi-level class tracking, and true P/L reporting. The only difference is who is paying the payroll tax payments, filing the quarterly and annual payroll tax returns. These options are not available in QuickBooks Pro for MAC. For businesses that want to process their own payroll, and do their own e-file and e-pay federal, state taxes, quarterly and annual payroll tax returns including year-end processing of W2s. * QuickBooks Enterprise Gold – comes with Enhanced Payroll subscription, no need to buy separate. Good for businesses that want to process their own payroll and have their taxes paid and reports done for them. Intuit will e-file and e-pay federal, state taxes, quarterly as well as their payroll tax returns filed for them including year-end processing of W2s. 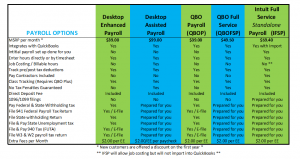 QBO has limitations to be aware of: You have to make your decision about full service payroll right away because you cannot upgrade from QB Enhanced to QB Full Service Payroll later. You cannot track job costing. QuickBooks Desktop Versions (Pro, Premier, Enterprise) allows you to do both. In these two integrated options you run the payroll checks and the difference is who is paying the payroll tax payments, filing the quarterly and annual payroll tax returns.